DK are publishing a number of books to coincide with LEGO: The Ninjago Movie. 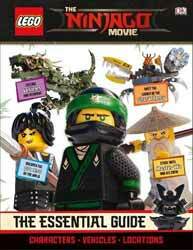 LEGO: The Ninjago Movie: The Essential Guide does pretty much what the title suggests, offering up fans a pretty useful guide to all things related to the film. It's aimed, pretty obviously, at the younger reader as it's big on pictures, with the minimal of text. The layout is attractive and eye-catching, with snippets of information laid out in boxes that are scattered over the page. This makes each page attractive to the eye and will certainly ensure that it keeps the attention of young readers. It's a pretty impressive book and certainly one that will be enjoyed by young fans of the movie.